Rock’s longest, strangest trip, the Grateful Dead were the psychedelic era’s most beloved musical ambassadors as well as its most enduring survivors, spreading their message of peace, love, and mind-expansion across the globe throughout the better part of three decades. The object of adoration for popular music’s most fervent and celebrated fan following — the Deadheads, their numbers and devotion legendary in their own right — they were the ultimate cult band, creating a self-styled universe all their own; for the better part of their career orbiting well outside of the mainstream, the Dead became superstars solely on their own terms, tie-dyed pied pipers whose epic, free-form live shows were rites of passage for an extended family of listeners who knew no cultural boundaries. The roots of the Grateful Dead lie with singer/songwriter Jerry Garcia, a longtime bluegrass enthusiast who began playing the guitar at age 15. Upon relocating to Palo Alto, CA, in 1960, he soon befriended Robert Hunter, whose lyrics later graced many of Garcia’s most famous melodies; in time, he also came into contact with aspiring electronic music composer Phil Lesh. By 1962, Garcia was playing banjo in a variety of local folk and bluegrass outfits, two years later forming Mother McCree’s Uptown Jug Champions with guitarist Bob Weir and keyboardist Ron “Pigpen” McKernan; in 1965, the group was renamed the Warlocks, their lineup now additionally including Lesh on bass as well as Bill Kreutzmann on drums. The Warlocks made their electric debut that July; Ken Kesey soon tapped them to become the house band at his notorious Acid Tests, a series of now-legendary public LSD parties and multimedia “happenings” mounted prior to the drug’s criminalization. As 1965 drew to its close, the Warlocks rechristened themselves the Grateful Dead, the name taken from a folk tale discovered in a dictionary by Garcia; bankrolled by chemist/LSD manufacturer Owsley Stanley, the band members soon moved into a communal house situated at 710 Ashbury Street in San Francisco, becoming a fixture on the local music scene and building a large fan base on the strength of their many free concerts. Signing to MGM, in 1966 the Dead also recorded their first demos; the sessions proved disastrous, and the label dropped the group a short time later. As 1967 mutated into the Summer of Love, the Dead emerged as one of the top draws on the Bay Area music scene, honing an eclectic repertoire influenced by folk, country, and the blues while regularly appearing at top local venues including the Fillmore Auditorium, the Avalon Ballroom, and the Carousel. In March of 1967 the Dead issued their self-titled Warner Bros. debut LP, a disappointing effort which failed to recapture the cosmic sprawl of their live appearances; after performing at the Monterey Pop Festival, the group expanded to a six-piece with the addition of second drummer Mickey Hart. Their follow-up, 1968′s Anthem of the Sun, fared better in documenting the free-form jam aesthetic of their concerts, but after completing 1969′s Aoxomoxoa, their penchant for time-consuming studio experimentation left them over 100,000 dollars in debt to the label. 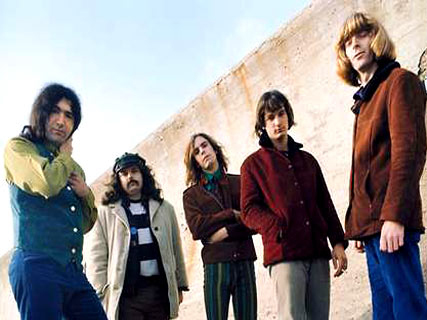 The Dead’s response to the situation was to bow to the demands of fans and record their first live album, 1969′s Live/Dead; highlighted by a rendition of Garcia’s “Dark Star” clocking in at over 23 minutes, the LP succeeded where its studio predecessors failed in capturing the true essence of the group in all of their improvisational, psychedelicized glory. It was followed by a pair of classic 1970 studio efforts, Workingman’s Dead and American Beauty; recorded in homage to the group’s country and folk roots, the two albums remained the cornerstone of the Dead’s live repertoire for years to follow, with its most popular songs — “Uncle John’s Band,” “Casey Jones,” “Sugar Magnolia,” and “Truckin’” among them — becoming major favorites on FM radio. Despite increasing radio airplay and respectable album sales, the Dead remained first and foremost a live act, and as their popularity grew across the world they expanded their touring schedule, taking to the road for much of each year. As more and more of their psychedelic-era contemporaries ceased to exist, the group continued attracting greater numbers of fans to their shows, many of them following the Dead across the country; dubbed “Deadheads,” these fans became notorious for their adherence to tie-dyed fashions and excessive drug use, their traveling circus ultimately becoming as much the focal point of concert dates as the music itself. Shows were also extensively bootlegged, and not surprisingly the Dead closed out their Warners contract with back-to-back concert LPs — a 1971 eponymous effort and 1972′s Europe ’72. The latter release was the final Dead album to feature Pigpen McKernan, a heavy drinker who died of liver failure on March 8, 1973; his replacement was keyboardist Keith Godchaux, who brought with him wife Donna Jean to sing backing vocals. 1973′s Wake of the Flood was the first release on the new Grateful Dead Records imprint; around the time of its follow-up, 1974′s Grateful Dead From the Mars Hotel, the group took a hiatus from the road to allow its members the opportunity to pursue solo projects. After returning to the live arena with a 1976 tour, the Dead signed to Arista to release Terrapin Station, the first in a series of misguided studio efforts that culminated in 1980′s Go to Heaven, widely considered the weakest record in the group’s catalog — so weak, in fact, that they did not re-enter the studio for another seven years. The early ’80s was a time of considerable upheaval for the Dead — the Godchauxs had been dismissed from the lineup in 1979, with Keith dying in a car crash on July 23, 1980. (His replacement was keyboardist Brent Mydland.) After a pair of 1981 live LPs, Reckoning and Dead Set, the group released no new recordings until 1987, focusing instead on their touring schedule — despite the dearth of new releases, the Dead continued selling out live dates, now playing to audiences which spanned generations. As much a cottage industry as a band, they traveled not only with an enormous road crew but also dozens of friends and family members, many of them Dead staffers complete with health insurance and other benefits. Still, the Dead were widely regarded as little more than an enduring cult phenomenon prior to the release of 1987′s In the Dark; their first studio LP since Go to Heaven, it became the year’s most unlikely hit when the single “Touch of Grey” became the first-ever Dead track to reach the Top Ten on the pop charts. Suddenly their videos were in regular rotation on MTV, and virtually overnight the ranks of the Deadheads grew exponentially, with countless new fans flocking to the group’s shows. Not only did concert tickets become increasingly tough to come by for longtime followers, but there were also more serious repercussions — the influx of new fans shifted the crowd dynamic considerably, and once-mellow audiences became infamous not only for their excessive drug habits but also for their violent encounters with police. As ever, the Dead themselves were also not immune to tragedy — on July 26, 1990, Mydland suffered a fatal drug overdose, the third keyboardist in group history to perish; he was replaced not only by ex-Tubes keyboardist Vince Welnick but also by satellite member Bruce Hornsby, a longtime fan who frequently toured with the group. In the autumn of 1992 Garcia was again hospitalized with diabetes and an enlarged heart, forcing the Dead to postpone their upcoming tour until the year’s end; he eventually returned to action looking more fit than he had in years. Still, few were surprised when it was announced on August 9, 1995, that Garcia had been found dead in his room at a substance abuse treatment facility in Forest Knolls, CA; the 53 year old’s death was attributed to a heart attack.